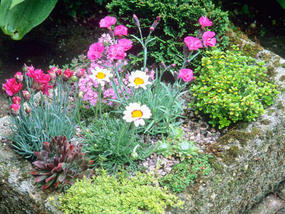 You may well have seen plants labelled ‘alpines’ in garden centres or nurseries, and wondered about growing them. While many of the plants so labelled have no special requirements, others do have specialist needs, so here are a few top tips to help you. True alpine plants are fundamentally mountain plants. So if you think about it, you’ll have a pretty clear idea of what conditions they like: thin, infertile, well-draining soil, plenty of sunshine, not too much wet. Most can tolerate winter cold, but not wet. The conditions that really damage them are freeze-thaw, but even a wet summer can be a problem. 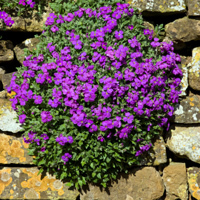 So you’ll need somewhere with these conditions, which could be a rock garden, a stone wall, or a container. You will be able to grow a wider range of plants in a container, because you can move it under shelter in winter, and so provide the dryness that alpines require. For the soil, you’ll need to make your own compost. Start with basic multipurpose compost, or perhaps a more specialist compost like mushroom compost, both available from compost suppliers. Add topsoil or garden soil, and grit, so that your compost is about one third of each, and mix thoroughly. Put plenty of crocks in the bottom of your container, to improve the drainage, then add the compost. Finally, once you have planted your plants, top dress with a layer of grit or gravel to keep moisture away from the surface. Although the majority of plants sold as alpines are small and low growing, plenty of them are not suitable for container gardening! So do your research. If you live near enough, go and visit one of the RHS Gardens, and have a look at their alpines, and buy any plants you particularly liked while you’re there. Do remember to check the labels for their growing habits, as you need plants that remain small in your container! As a general guide, saxifrages and sedums are pretty good, although some can be rather too vigorous. Sempervivums are well-behaved, and also relatively easy to grow. Rhodohypoxis are pretty little plants that do well in alpine containers, and reliably come back year after year. If you have a very sunny spot, you could also try a Lewisia, as these have beautiful showy flowers, and love dry sunshiny spots such as wall crevices. Beyond these two tips, our main recommendation is to try things out. If they don’t work, don’t worry. You can always transplant a ‘thug’ into your garden, or replace a dead plant with an alternative. After all, a container garden doesn’t stand still, but is a living, changing entity, so go ahead, change it!